Does Bench Pressing Cause Migraines? Don't let migraines take away your bench press workout. Weight training is a great way to improve your fitness, but it can be hard to motivate yourself to get to the gym if lifting gives you a headache. In some circumstances, it is possible for bench pressing to cause migraines. The solution for this problem could be changing the amount of weight you press, changing your habits during an exercise routine or simply changing your diet. The factors involved in effort-induced migraines vary from person to person. Don't quit the gym just yet. One possible reason for the link between weight training and migraines is that challenging effort causes muscle contractions that can cause pain on sensitive nerves in the brain. The trigemino-vascular system is a collection of nerves that supply the brain with sensation. They help you feel light touches on your face, but are sometimes too sensitive. Increased blood pressure from muscle contraction in the area, such as the neck and shoulders, can inflame those nerves and cause pain. An intense muscle contraction when you bench press can unbalance your blood flow, causing a migraine-level headache. Bench pressing with extremely challenging weights can cause blood pressure to rise throughout your body, not simply in the muscles you contract to complete the exercise. Pushing yourself to press heavy weights gets your heart rate up. Increased blood pressure results in the pain most commonly associated with migraines: the pain of excessive amounts of blood being forced through your head. Typically, migraines are caused by blood vessels contracting and dilating in your brain, which disrupts the pressure of blood and causes temporary blindness and pain, but similar painful spikes in blood pressure can also be caused by lifting weights. 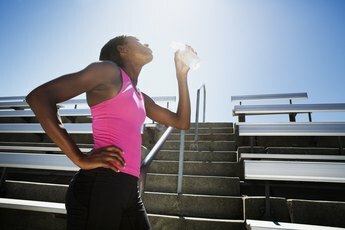 A bottle of water might save your head and your workout. One common cause of migraines is dehydration. Bench pressing can make you sweat, particularly if you are in a warm gym, and pushing your body physically without proper hydration can trigger a migraine. Drink plenty of water before working out, and keep yourself hydrated throughout your routine, to avoid starting a migraine. Be especially mindful of your hydration after a night of margaritas with the girls, or after a sweaty cardio routine. Common medications, both prescription and over the counter, can also cause dehydration; for instance, allergy pills. Popping a daily allergy pill before a challenging workout might lead to a migraine. Even if you have prescription medicine that battles migraines, prevention is your best option. In a 1982 report published in the "Annals of Emergency Medicine" a patient who suffered from migraines brought on by physical exertion was cured when he changed his routine to lighter weights. Inadequate warm-ups can also lead to a migraine, so always do a few minutes of cardio or dynamic stretching before you bench press. Track your diet in relation to your migraine bouts; an allergy to food or a sensitivity to caffeine might be the actual culprit, not your bench press. Are you focusing on a bright light in the ceiling above your bench while you press? Move your eyes around to prevent a migraine brought on by photo-sensitivity. Massages and relaxation techniques after a workout can be beneficial as well. 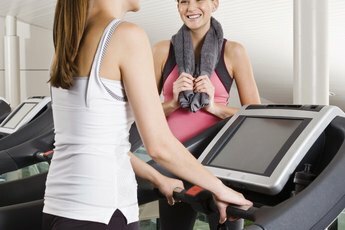 What Does It Mean When You Get Lightheaded From Running on the Treadmill? What Causes Burning in the Esophagus During Cardio Exercise?